No, really. We’re going to talk about mochi, but to talk about mochi, we need to talk about glutenous rice. To talk about glutenous rice, we need to talk about what makes it special, and to do that, we need to talk about starch. And this is a molecule that plays a lot of roles in Sterling Archer’s fictional life. 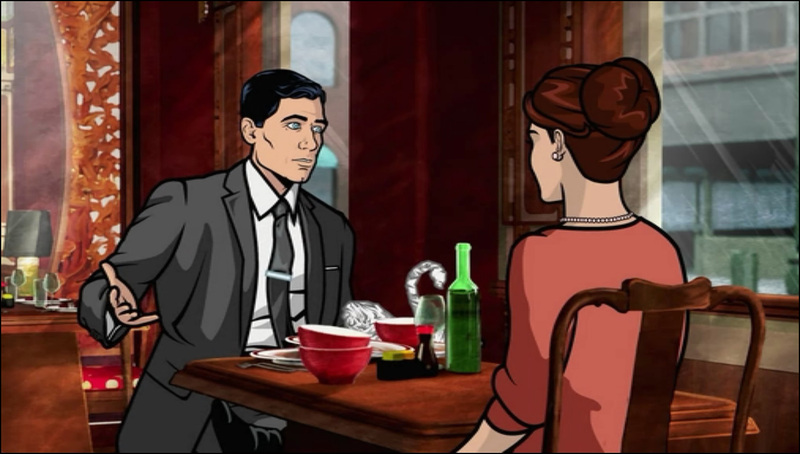 If you’re not familiar with the show, the short version is that Sterling Archer is a spy for the International Secret Intelligence Service (ISIS), a U.S. government contractor headquartered in New York City. And you should be ashamed of yourself for not watching it. It’s on Netflix and it’ll be returning to TV in 2014, either on FX or FXX (now that that’s a thing). Extremely not to scale. Actually, there are 150 times more amylose molecules than amylopectin molecules, because amylopectin is just that much bigger. 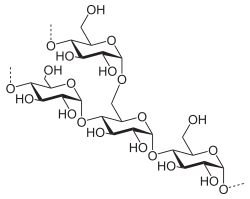 As you can tell, amylose is a molecule that’s basically straight (although it does contain a few branching points), while amylopectin is a much more complicated structure. In ordinary, status-quo starch, these two molecules snuggle together and form hydrogen bridges in a semi-crystalline structure that’s dry and crumbly. When cooked in hot water, the hydrogen bridges break and the amylose distributes into the water. If that same mixture is cooled while the water is still present, a process called retrogradation occurs; amylose and amylopectin start to form hydrogen bonds, and the result is a gel the consistency of, say, a starch-thickened egg drop soup that Archer might enjoy at the Chinese restaurant. Take that same starch and remove all of the water and it returns to the crystalline structure it was in before being heated–an application Archer enjoys when he’s wearing a crisp white shirt. Which, of course, is almost all the time, except when it’s time to wear a dark black turtleneck. Or a slightly darker black turtleneck. And then there’s Play-Dough, a starch gel with added oils and surfactants to achieve the desired consistency. Archer can use this, too, believe it or not: a fingerprint pressed into Play-Dough can defeat a basic biometric scanner. Not fancy ones with temperature sensors, but basic ones. Probably the ones that’ll be showing up in the new iPhone. Because of the very long chains of molecules a starch and water gel, certain concentrations of starch and water form shear-thickening non-Newtonian liquids, which is to say, they get firmer when you strike them. This interaction inspired a new kind of wearable bulletproof material, called “bulletproof custard,” that I’d expect to see in Archer’s replacement turtleneck. So that’s starch, an absolutely crucial part of Sterling Archer’s everyday life. I mean, plus, it’s kind of his name. Sterling Archer. So what’s that have to do with rice? The different concentrations of amylose and amylopectin in a type of rice determine the characteristics of that rice. For example, long-grain rice tends to have lower amylopectin concentrations; as it cools, it loses any stickiness faster, turning into grains that separate more easily. The rice we used to make Yesterdish’s lobster and corn risotto, by contrast, has higher concentrations of amylopectin; the result is a creamy texture retained even when it’s not warm at all. And then there’s sticky rice, or sweet rice, or glutenous rice, or mochi rice–whatever you want to call it. Sticky rice is almost entirely amylopectin with trace amounts of amylose. When the rice is broken down with water and heat, there’s no significant free-floating amylose to form hydrogen bonds. The result is a very soft gel, which makes the dish very sticky and slightly chewy. To make mochi, it’s possible to grind the rice after it’s been cooked, but the traditional method is to grind the rice in advance into a flour called mochiko. That’s then mixed with water and sugar and steamed. 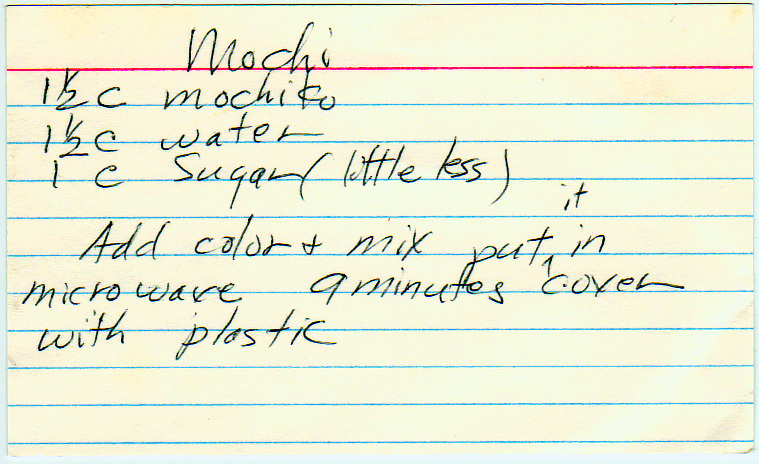 But just as we learned to steam corn in the microwave in Yesterdish’s no husking steamed corn, our recipe card calls for steaming the mochi in the microwave. Add color and mix; put it in microwave 9 minutes, cover with plastic. Be sure to use at least 35% butterfat heavy cream.